According to the US State Department, there are an estimated nine million Americans that live abroad -- roughly 3.7% of all US citizens that were eligible to vote in 2016. That is equivalent to the state of Ohio or Illinois, and more than enough to sway a presidential election. Getting the vote out among these citizens, however, is an enormous challenge. 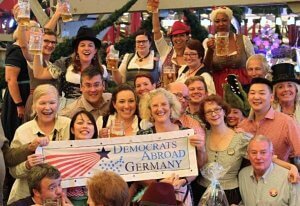 At the forefront of that effort is Democrats Abroad. 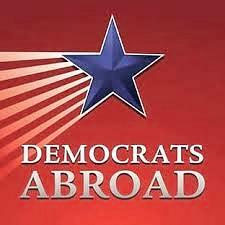 Democrats Abroad is the official organization of the Democratic Party for United States citizens living permanently or temporarily overseas, and who strive to provide Americans abroad a Democratic voice in our government and elect Democratic candidates by mobilizing the overseas vote. The organization is given state-level recognition by the Democratic National Committee and is represented on the DNC by eight voting members, as well as at the Democratic National Convention. They have 45 country committees throughout Europe, the Americas, the Middle East, Africa and Asia, and members in more than 190 countries around the globe who vote in every state and Congressional District in the United States. Efforts to secure the voting rights of overseas citizens began with Democrats in Paris and London during the 1960 Kennedy-Nixon Presidential election, leading to the creation of Democrats Abroad in 1964. It was not until the passage of The Overseas Citizens Voting Rights Act of 1975, however, led by then House Majority Leader Tip O'Neill, that the rights of these citizens were recognized. Led by Democrats Abroad, legal protections and full voter access to register and vote by absentee ballot was finally provided The Uniformed and Overseas Citizens Absentee Voting Act (UOCAVA) of 1986. Since UOCAVA was enacted, legal barriers to expansion of voting have been removed, including the Help America Vote Act of 2002, which instituted permanent registration for two full federal election cycles, and the first collection of statistics on overseas absentee voting. In 2016, approximately 634,000 votes were cast from abroad. Although the number pales in comparison to those eligible, the increasingly number of votes of Democrats Abroad have the power to sway elections. Essentially the bluest of all states, they helped bring home wins for Senator Maggie Hassan in New Hampshire and Governor Roy Cooper in North Carolina. the US Merchant Marines, and their family members; US citizens employed by the federal government; and private US citizens residing outside the United States. They vote in the US state where they are registered, but each state has different procedures and deadlnes, so the act provides for an emergency back-up ballot, the Federal Write-In Absentee Ballot (FWAB). The FWAB can be cast by voters who "have made a timely application for but have not received their regular ballot from the state or territory, subject to certain conditions." The act does not apply to non-federal elections, although some states and territories allow qualifying citizens to register and vote in state and local elections as well. Pass this on to friends overseas! Sign Up to Receive the Dailys in your inbox!